With the holidays approaching, we all want the easiest, most delicious, inexpensive, and the most beautiful recipes, don’t we? That’s not asking for a whole lot, is it? So many of our favorite traditions revolve around food. The smell of that succulent turkey roasting, the baking gingerbread that Grandma used to make every Christmas Eve, snuggling around the crackling fireplace after caroling with my whip cream dolloped hot chocolate mug nestled between frigid fingers are just a few ways that my senses are stimulated. It’s amazing how instantly I am brought back to those special moments by just an aroma. This is a new recipe for me this holiday season of 2008, and I am thinking it may become the start of a timeless tradition. Certainly one that will not be regulated to the “holiday” box, but one that may become a once a week kind of tradition. You probably have all the ingredients in your cupboard right now, so don’t procrastinate. When ever I use anything like a box mix, whether it be for cakes or even pancakes, I always add a little dash of flavoring such as strawberry or gingerbread…whatever I have on hand. For this recipe, I added a “dash” of almond flavoring/syrup (the kind you might put in your coffee). This extra magic ingredient is what fools everyone into thinking you made it completely from scratch, and that’s the effect we are going for, right? Beat cake mix, eggs, bananas, sour cream and oil with mixer on low or until moistened, scraping bottom of bowl often. Bake 35 minutes or until the toothpick comes out clean. 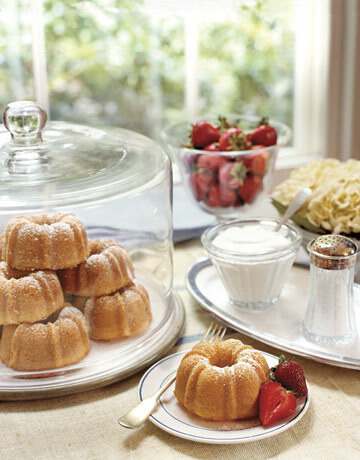 Use a 13×9 or full size bundt pan. Cool cake completely in pan on wire rack. If you start thrifting like I have been telling you to, you might have an adorable pan like this just calling your name from the back of the cupboard. Yes, the difference between a yummy tasting cake, and a yummy tasting cake which turns into eye candy, is this $1 pan that I picked up a few weeks ago when I was out treasure hunting. I know, I know, aren’t they adorable? Can I tell you how moist and melt in the mouth marvelous they were? Did I tell you that this only took less than five minutes of “work”? I split the batter in half between the mini bundt cakes, and a 9 inch round pan. Frost the cake with my Easy Cream Cheese Frosting Recipe. Spread top with frosting. If you have used a 13 x 9 pan, then cut cake crosswise in half. Frost the top of one, and then top with remaining cake half and repeat by frosting top and sides. You can press nuts onto the sides or sprinkle with chocolate jimmies. If you are doing this at Christmas time, then green and white sprinkles would be pretty as well. No lie – I was so excited to photograph a food post from start to finish, but by the time I went to take the picture of the finished frosted product, this is what I found. Yep, it was a hit, and truly, the frosting is not even needed. But just in case you need the “finished product” pictures, I had fun searching through Country Living. They came through for me, and theirs look almost as nice as mine. Too bad you couldn’t see my masterpiece….wink, wink. I love the simplicity of the powdered sugar. Here they used chocolate cake and inverted two of my mini cakes to form pumpkins…too cute. Really, I almost thought of that. Yep, this is what mine looked like with the cream cheese frosting. Even a little bedlam made it into the picture by a bowl-licking Lab named Lola. I love the Ideals. The cakes to form pumpkins is so great . I will have to do that. Thank you so much. That looks so good! I love all the ideas that you shared! Now I want one of those cake pans. That looks so GOOD. I am all about easy so I’ll have to try it. Now I WANT that PAN!!! Oh my I LOVE those little small cakes!!! After 11 years of marriage – I need to re-stock many things in my kitchen. I’m thinking yard sales is the way to do it. Thanks for the adorable post. We are BIG-TIme Banana bread fans around here. Oh- I’m thinking Christmas gifts for the neighbors this year. Love that. BTW, you are making me hungry with all that yummy ‘banana bread’. I want that pan! I am envious. I will not pay big money for pans either and that pan looks perfect. Powdered sugar makes things looks so nice. I found a cast iron corn bread pan at a yard sale for $1 also. It makes just enough for our reduced numbers these days (5 for dinner vs. 10 as we used to have). I see them in antique stores for $25! Jen, you're so cute! I wish I had one of these beauties right now…they look delish. And that cute little pan is just adorable…good for you, $1. That's my kind of bargain. Can't wait to see more of your finds. Yep, yardsale season is about gone, but I lucked out & found myself a sewing machine at one last weekend. That's what I'll be playing with this winter! I collect stars and got the coolest bunt pan with stars all over it at a yard sale for $3 bucks! I still would have paid more though!! Yum I can’t wait to try these! uh, YUM! and how cute were those! The stoneware mini bundts or whatever you want to call those were on sale on the pampered chef website, but that sure doesn’t been $1. I but they were that much yummier because of that. I may make these for my MOPS brunch on Nov 13th. Thanks for the idea!! And did I mention how adorable those were? Sounds scrumptuous! Can’t wait to try it. Loved the dog licking the pan! LOL!!! LOVE the dog licking the bowl. Priceless. OMGOODNESS those are SOOOO adorable. I’m totally going to make these for Thanksgiving…make the pumkins. OH THANK YOU for this one! Girl, did you get a new camera?! I remember your persistent photographic apologies back when you started this bloggy thing – and now your photos look as good as Country Living’s photos! Kudos! those look SO yummy!! I’ll be trying these out for Thanksgiving! Those look wonderful! I’ll definitely give them a try…but I want to find one of those pans. What pretty pictures! Actually, your whole blog is pretty. It’s my first time here so I’m really enjoying taking a look at your older posts too. Those cakes look delicious and so easy to make. I’ll have to give them a try real soon. You make me laugh, Jen! hello jen! thank you so much for stopping by my blog and taking the time to say hello! this recipe sounds delicious and what a fabulous find you have in that cake pan!!!! I heart a great deal!! THANKS for the awesome recipe. Those look adorable and delicious. And, you are right about converting us into yard salers… especially with finds like the cake pans for $1. You Rock! These look delicious! I am going to try these soon! Cute cakes–those pans tempt me every time I see them in a store. Is it possible to bake this recipe in a regular bundt pan? How would you adjust the temp or baking time? yes, you could definitely make this in a bundt pan with the same temp. Check after 30 minutes to see if toothpick (or knife) comes out clean.